Professionals that hold eligible certifications or licenses are able to transfer their credentials between jurisdictions that use IC&RC products. IC&RC seeks to ease the stress of individuals needing to move their credential or license from one jurisdiction to another through its reciprocity process. Individuals holding a credential through an IC&RC member board may be eligible for reciprocity into other IC&RC Member Boards. Boards may offer reciprocity to certified or licensed professionals in other jurisdictions and have the authority to set reciprocity requirements for entry to their jurisdiction. Not all certifications and licenses are eligible for reciprocity. It is vitally important that certified professionals investigate reciprocity prior to relocating to another jurisdiction, because it can be a very complicated process. 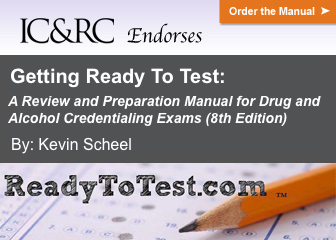 It is recommended to reciprocate at least three months prior to a credential's expiration. Please note, IC&RC can only facilitate reciprocity from one IC&RC Member Board to another. Credentials or licenses that are state specific or offered through other organizations such as NAADAC, NBCC, or the Breining Institute. You can determine if your credential or license is eligible for reciprocity by reviewing the IC&RC Member Board profile for your jurisdiction on our Member Board directory. 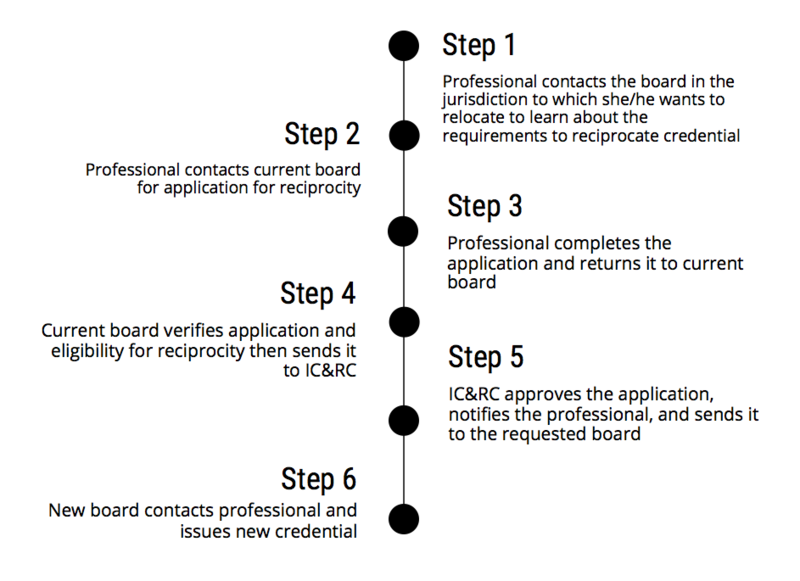 Professional contacts the IC&RC Member Board in the jurisdiction to which s/he wants to relocate to learn about the requirements to reciprocate credential. Professional contacts current IC&RC Member Board for Reciprocity Application. Professional completes the application and returns it to current board with the appropriate fee. Current board verifies application and sends it to IC&RC. IC&RC approves the application, notifies the professional, and sends it to board in new location. New board contacts professional when the process is completed. Can I reciprocate my credential to any IC&RC Member Board? When should I begin the reciprocity process – before I move into my new jurisdiction or after? Can I maintain my credential in more than one jurisdiction? If my credential has expired in my current jurisdiction, can I still reciprocate into a new jurisdiction? When I reciprocate to a new jurisdiction, will my current expiration date on my credential change? Can I be denied reciprocity into a new jurisdiction? How long will it take to hear about my reciprocity application after I send it my Member Board? If I hold a license rather than a certification from my jurisdiction and then reciprocate, will I receive a license from my new jurisdiction? What is the difference between certification and licensure? Is my NAADAC credential eligible for reciprocity with IC&RC boards?